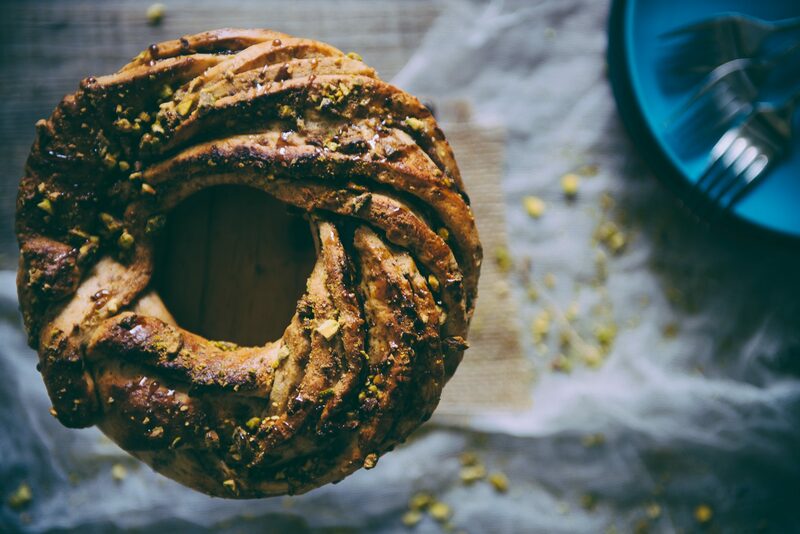 Enjoy the Middle Eastern inspired flavours of this braided cardamom bread. 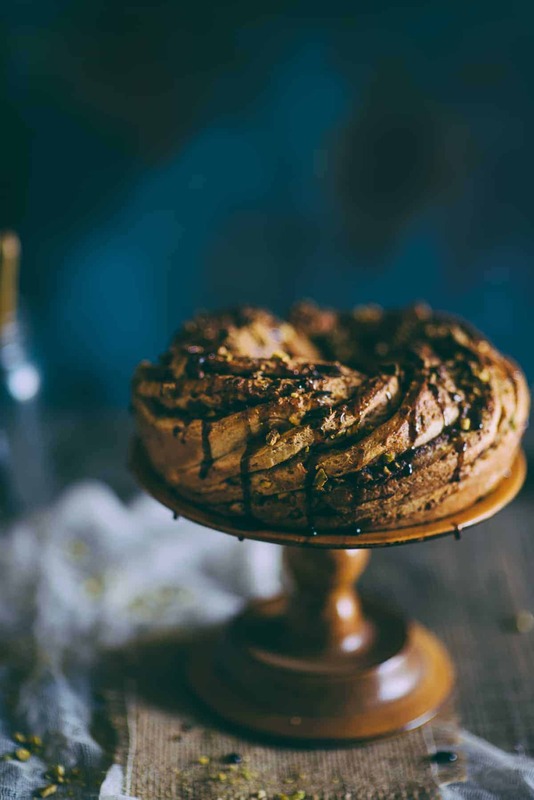 Filled with pistachios and lightly scented with cardamom you’ll be reaching for second slice in no time! There’s nothing quite as glorious as bread baking in the oven. The aroma grabs you from within, virtually taking your taste buds hostage. It’s about the anticipation. And the satisfaction of that first bite. I’m sure we’ve all experienced that feeling. I had been itching to bake some bread for awhile now… Last time I presented you with a no knead Kalamata olive spelt bread (try saying that fast!). This time I’m taking it up a notch. My cravings were calling out for cinnamon buns. Even though I’ve never made them before on the blog, I wanted to follow that path. This braided cardamom bread is quite similar to my light brioche bread from a long time ago except that it’s braided. I’ve given it a “Middle Eastern vibe” by flavouring it with ground cardamom. And this is further enhanced with a filling of butter, chopped pistachios and a “hint” of pomegranate molasses. It definitely falls into the “something special” category and does take a little time to put together. (That’s taking into account the proving time). It will impress. And so it should. I made this twice, the first time using a date paste which ran all over the buttery dough turning it into a near, soggy mess. And my bundt pan was a little small, hence it was slightly thicker than I would have liked it. I didn’t think to just bake it without using a pan but I was worried it would not hold it’s stunning round shape. But it tasted heavenly. I could have let it cool a lot longer but I couldn’t wait! If you were good at boy scouts/girl guides the braiding will come naturally. I had to think about it! In the end I was happy with this creation and served it up to friends who commented on the flavour being different. Scroll down for the braided cardamom bread recipe. A braided bread made with Middle Eastern inspiration, Dates, pistachios and pomegranate molasses make this to die for! Combine the milk and butter in a saucepan over a medium heat and allow the butter to melt and the mixture to come to a lukewarm temperature. (If it heats too much cool it down by placing the saucepan in a sink with cold water). In a separate bowl combine the yeast, flour, sugar and salt. Make a well in the centre and pour the milk/butter mixture in. Mix thoroughly until you have a dough. (You may need to add a little more flour here to stop the dough from being sticky). Preheat your oven to 190 deg C and butter a 22cm bundt cake tin and set aside. Prepare the filling by beating the softened butter, cardamom and sugar in a bowl. Set aside also. Remove the risen dough, punch it out with your fist and roll into a large rectangle meauring approx. 40cm x 30cm in size. Spread the cardamom/butter mixture over the dough, sprinle ¾ of the pistachios and drizzle the pomegranate molasses. With the long end facing you roll the dough into a long cylinder/sausage shape. Using a very sharp knife, cut down the length of the centre of the rolled dough, exposing the layers and filling inside. Alternate the two long pieces of dough over each other to create a braid and shape into a ring. Gently place into the greased baking tin, brush with beaten egg and sprinkle any remaining pistachios on top. Bake for 25-30 mins until golden. Allow to cool in the tin for ten minutes before gently removing. Allow to cool for a further half hour before slicing and serving. (Optional - drizzle some pomegranate molasses over the top for an extra "zing").